Yuan-denominated gold contracts have implications for countries like Russia, Iran, Qatar and Venezuela; they would be less vulnerable to the dollar as a ‘soft weapon,’ and most oil producers would be happy to exchange oil for gold. China has indicated that those prepared to sell oil in yuan will benefit from more business. Producers that will not sell to China in yuan will lose market share. China proposed pricing oil in yuan to Saudi Arabia in July. It is unclear if Saudi Arabia will concede, but Beijing has been reducing Saudi Arabia’s share of its total imports, which fell from 25% in 2008 to 15% in 2016. Chinese oil imports rose 13.8% during the first half of 2017, but supplies from Saudi Arabia went up just 1%. Meanwhile, Russian oil imports jumped 11%, making it China’s top supplier. Angola leapfrogged Saudi Arabia into 2nd spot with an increase of 22% in oil exports to China in the same period. 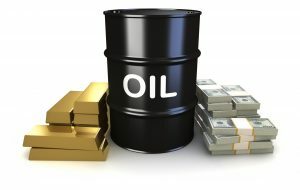 If Saudi Arabia accepts the yuan settlement for oil, it would be a threat to the dollar’s hegemony, and it is unlikely the US would continue to approve modern weapon sales to Saudi and the embedded protection of the House of Saud. The alternative for Saudi Arabia is equally unappetizing. Getting boxed out of the Chinese market will mean having to dump excess oil inventories on the global stage, thereby ensuring a sustained low price for oil. But the kingdom is finding other ways to get in with China. The government is looking at issuing a yuan-denominated bond. Saudi Arabia and China have agreed to establish a $20 billion joint investment fund, and China may take a cornerstone investment in the planned initial public offering in Saudi Aramco, the national oil company. If that deal goes through, the pricing of Saudi oil could shift from dollars to yuan. It would mean a degree of influence over nearly 40% of global production, and China will be able to further exclude dollars for yuan.